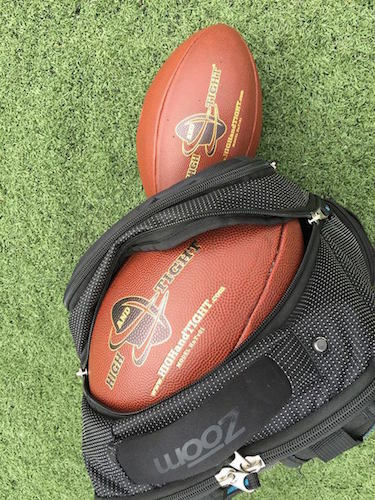 High and Tight, a beeping football created by an assistant coach at Midland-based Northwood University that is designed to prevent fumbling among players, will be used this month at several NFL training camps. Launched in January, the product will be used at summer training camps by the Dallas Cowboys, Washington Redskins, Buffalo Bills, Baltimore Ravens, Indianapolis Colts, New Orleans Saints, and San Diego Chargers. The technology is also currently being used by football teams at Michigan State University, University of Notre Dame, University of Oregon, Texas A&M University, and University of Tennessee. The High and Tight ball uses pressure sensors within each of its panels to detect when it is being held with equal distribution of weight. When a player holds the ball correctly — close to their chest and positioned accurately — the ball makes a sound. Creguer says the football, which retails for $170 on the company’s website, conditions players to hold the ball correctly and avoid fumbling, which often occurs when it is held low to the ground and away from the body. Creguer partnered with Central Michigan University Research Corp., a SmartZone funded by the Michigan Economic Development Corp., to help him get a patent, receive starter funds, scale his market, network, and produce marketing materials for High and Tight. He says his company is looking to develop more partnerships and will educate children about proper ball handling with the addition of youth football sizes in the fall. To learn more about High and Tight, visit highandtight.com.